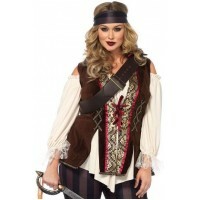 This longer length womens Caribbean Castaway Pirate costume would be perfect for Pirate Fests. 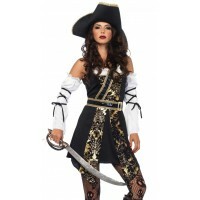 This Caribbean Castaway Pirate costume has a ragged hem skirt that falls from knees to mid-calf with a peasant top, crop sleeves with lace up ribbon detail, attached sash with matching head wrap, and cross body buckled strap. Item Number: LA-c85621 | Approximate Size (Inches): 10.00 wide x 3.00 deep x 14.00 high | Approximate Shipping Weight: 2.00 lbs. 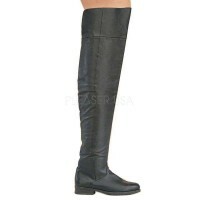 These leather pull on boots have an awesome look with a comfortable 2 inch heel and laces ..